Disposable Pillow case - 200 pieces - White or Blue - 65 x 65 (26" x 26") - 45 x 60 (18" x 24") - 50 x 75 cm (20" x 30"). New soft and strong material. This new material can be thrown away after use (and can be used for 1 month). The pillow cases come individually packaged and therefore are clean every time. 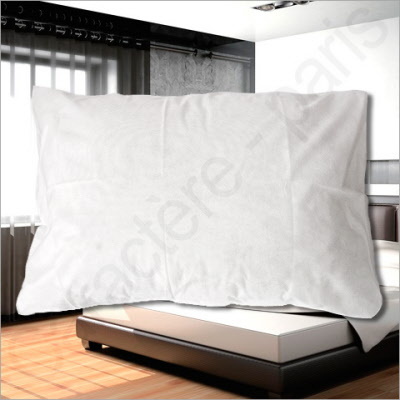 This pillow case can also be used for protection of your pillow against accaries (against allergies) or swelling. The pillow cases are open in the middle for easy used and offer better protection. The pillow cases are over-sized this case (65 cm - 26") to be sure to fit all pillows sizes (usually 24" x 24" or 60 cm x 60 cm). You must choose the proper size for your pillow. The pillow cases also existing in 45 x 60 cm (18" x 24") or 50 x 75 cm (20" x 30") and also in bolster case.